Have you ever given a thought to your last love letter? I do not mean “love letter” in the Valentine’s sense. I mean an after you die letter that is left to your loved ones, family and friends; a letter that is positive not negative. Picture this in your mind, amidst tears and sadness your loved one receiving a special letter after you die. Can you see them reading and rereading your words? Have you answered questions or left comments of praise and affection? This is your last chance to say what you need to say. Always keep “to do no harm” in the forefront. If you cannot say or write something nice, do not say anything at all. WORDS ARE POWERFUL! I often wonder of those who would deliberately leave a negative, malicious intended letter to someone after they have died, if it speaks volumes about the letter writer or does it reflect on the perceived relationship between those concerned. It is sad but true, there are people who will do this; if this speaks to you, please reconsider and DO NOT leave a letter at all. I know there are situations that require diplomacy and perhaps somewhat of a “taking the higher road” approach when looking back on relationships. If at all possible, consider coming from a compassionate spot and writing from an “I” perspective, not an accusatory “you” standpoint where fingers are pointed at someone else’s actions. Sometimes death is in the near future and you may have time to write your letter(s). For others, you may want to start writing letters now to those you care about and set them aside, perhaps add more to them as life goes on. Putting notes with your will is another idea. Mentioning special moments you remember, times you smiled and cried together. How proud you are of the person they have become. Leaving words of wisdom for situations that may arise in their lives. Perhaps mentioning what inspired you in life and what you found difficult. How you overcame challenges and came to understand life the way you do now or where you had hoped to be. You could be the one who leaves a loved one with a smile and warmth in their heart at a time when grief and sadness may be strong. Perhaps forgiveness for self or another person is what is needed and can be stated in this format. 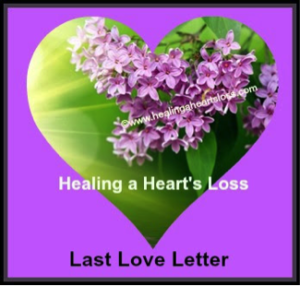 A letter may have the effect of healing a heart’s loss with something tangible to hold onto, to reread when needed; a special sign of love specifically for that individual from you.